Out do the competition or take on the world. With Toshiba's Qosmio X775 laptop, you'll enjoy elite mobile performance. Fire up this fully loaded laptop and get set. Your gaming will never be the same; you'll multitask like a madman; and your killer creations will come together without a hitch, thanks to the latest technologies like visibly smart 2nd-generation Intel Core processors,10 plus NVIDIA GeForce GTX 560M graphics with battery-saving Optimus technology. So it can keep up with the most demanding, graphics-intensive apps with ease. And a massive hard drive takes in video, music and documents like some voracious animal. Entertainment? 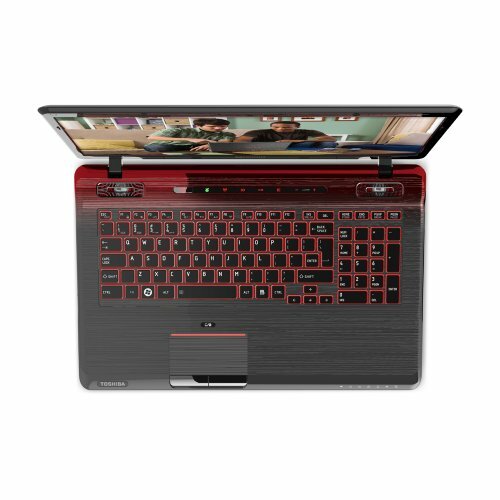 This laptop rockets into the stratosphere with a brilliant 17.3" diagonal HD+ TruBrite display, premium Harman/kardon speakers with a subwoofer, sound enhancement technologies from Dolby and Waves Audio, plus Toshiba's exclusive Resolution+ DVD up convert technology. Plus, it offers extended media capabilities so you can plug right into a home entertainment center, and drop-dead styling that includes a Fusion X2 Finish and an LED-backlit keyboard. Fully pumped up and decked out, the Qosmio X775 laptop is ready to smack down your opponents, inspire your creativity or get down to some serious entertainment.